It’s that time again – monthly fabric box delivery from Vinegar and Honey! This month’s box featured a lovely 2 yard cut of black and white striped liverpool knit. If you’re interested, here’s how to get your own BeeBox next month! For myself, I decided to go with the George and Ginger Heat Wave Hot Pants pattern. I really love the vintage silhouette of these. Plus, they’re exceedingly comfortable and super quick to sew up. So awesome! However! It was worth it. This time I made the smaller size and the fit is very good. I’m discovering that I am pretty annoying to fit in terms of sizing…I am tall, but short waisted. But that’s not all, my “total crotch length” is disproportionally long. So properly fitting a pair of high waisted shorts is pretty hard. I had to take an inch out of the top of the pants below the waistband so that they would hit at the right place on my waist (despite being 2″ taller than what is the pattern is drafted for). Next time I’ll make one more adjustment and I think I’ll have the perfect fit. Of course, that won’t stop me from wearing these! 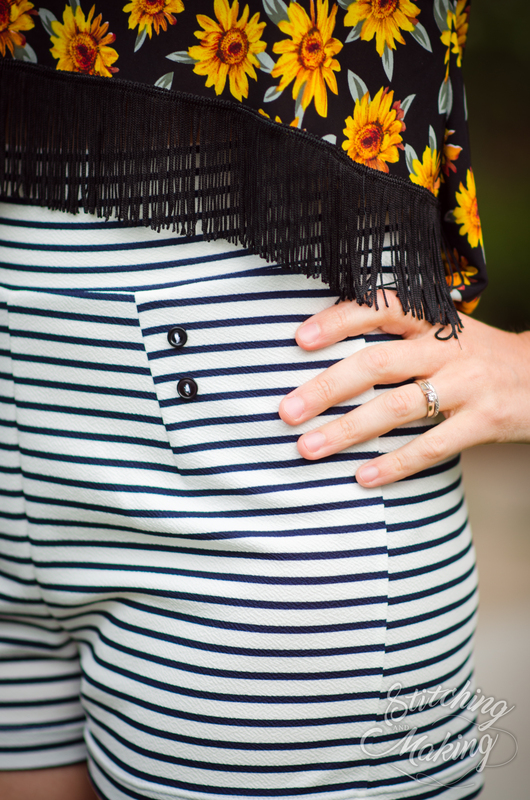 I’m pretty obsessed with putting buttons on things lately (stay turned for more evidence of that!). I thought the dart lines here would be the perfect place for buttons and I think I’m right! Just adds a little extra vintage cuteness. My shirt here is the Patterns for Pirates Free Spirit Tank in cropped length, with added fringe. 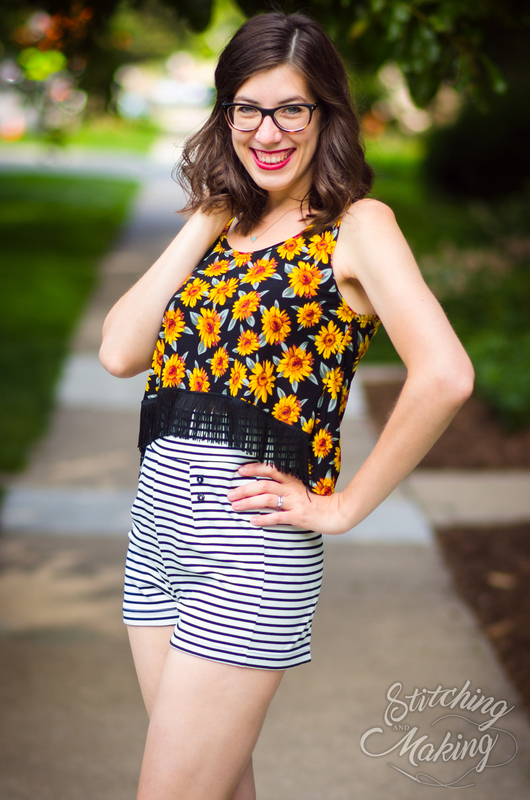 The sunflower print is so awesome, and it’s an ITY so it’s super lightweight and breathable. I actually made it last summer but needed the perfect shorts to pair it with. I think I’ve hit the jackpot! I really love sewing with liverpool and this one was no exception. VHCO wins again! It’s very sturdy yet stretchy and holds its shape so well. This is why its especially great as a bottom weight fabric. I have a circle skirt made from liverpool (as is suggested to be made with this BeeBox) and it drapes so nicely! It also means its not fiddly or annoying at all to sew, which is a huge deal. It kind of has an almost “spongey” feel to it, which is pretty unique. This particular cut is no exception; I really like it a lot! Since the Hot Pants only required about a yard or so, I still have quite a bit of this lovely fabric left over. I will definitely put it to great use; the dilemma will be what to make next because I have a ton of ideas and will need to pick only one or two more! 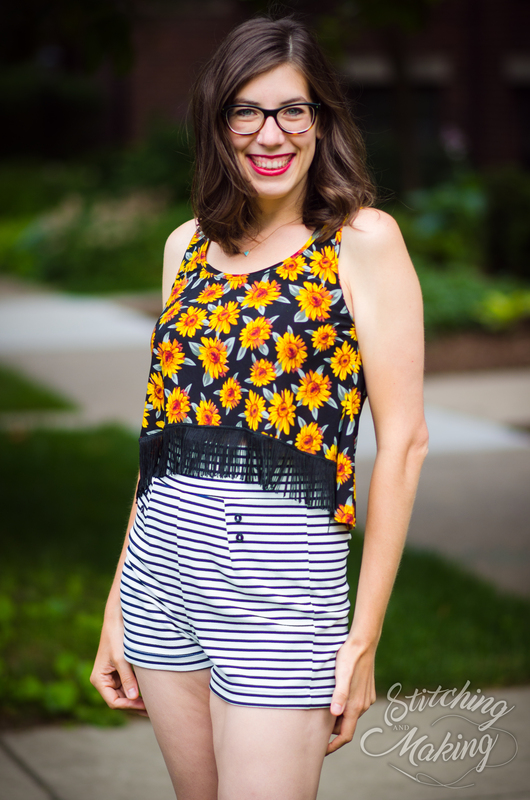 Take the Plunge Swimsuit – Pattern Release! So gorgeous; a little slice of summer perfection!